So, I recently covered Operation Wolf. 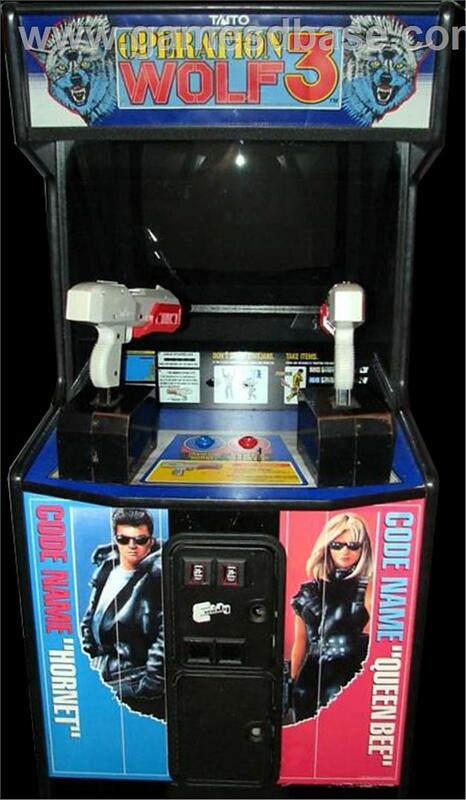 The thing about Operation Wolf is that to anyone who knows anything about retro gaming, it's one of the "Heavyweight" names, one of the games that could be found in almost every single arcade in the day, a red-hot licence that publishers for the home market were eager to sign up. 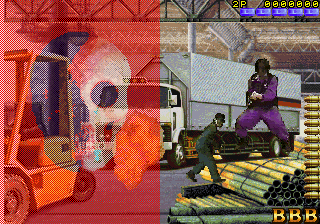 Operation Thunderbolt followed, adding multiplayer and 3D scaling, but unfortunately at the expense of the sheer quality Operation Wolf oozed. However, it remained a decent game. When I first saw Operation Wolf 3 in Mr B's, Blackpool, I was intrigued. After my first play, I was disappointed. After subsequent plays I was devastated at the way the licence had descended to absolute crap. Which is a shame. So what went wrong? Erm... everything, really. 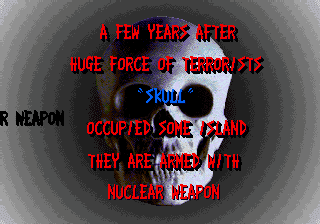 First off, the game went down the route of digitised graphics, which as we all know is subject to an unbelievable amount of hit and miss when it comes to the end result. The Mortal Kombat games were hits, Pit Fighter and Guardians of the Hood were epic misses (in comparison, at least, I know I've confessed a degree of love for Pit Fighter and its faults previously)... switch genre, and it's a case of Lethal Enforcers is a hit, Operation Wolf 3 is a miss. Is that all that's to blame? No. 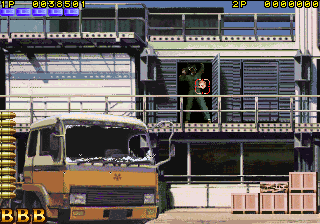 Probably the most bizarre aspect of the game is the ammunition system. Gone are the magazines and limited bullets... and in its place a totally unrealistic "wear-down" system. Basically, you hold down the trigger and you fire continuously full-automatic until the ammunition bar is exhausted. If you release the trigger at any point, your ammo is IMMEDIATELY refilled. However, keep the trigger down and you will keep firing, just at a much reduced rate. Seems very silly to me, but hey. Probably the only improvement on the ammo side of things is the new weaponry you can collect, which looks as though it's directly inspired from Lethal Enforcers, even down to the graphics used for the ammunition bar. In fact, while we're on positives, let's cover the rest of them very quickly. The graphics are nicely detailed, the gun's accuracy seems good, and I actually like the shotgun-style "bomb" launcher on the gun rather than just a button near the barrel that Wolf & Thunderbolt had. Unfortunately, these points aren't enough to save the game from being banished to the pit of distinctly average games. 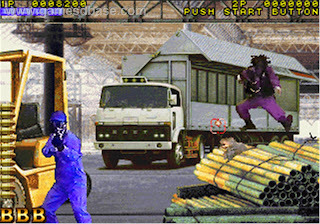 Levels are too short, and later levels get ridiculous as enemies pop up ridiculously quickly and with unbelievably fast reaction times, sometimes shooting you virtually immediately... which in a game with only 3 lives as opposed to the longer energy bars of Wolf and Thunderbolt, is just too much. Maybe I'm being harsh, maybe I wouldn't dislike this game so much if it had an original name and completely disassociated itself from the distinguished name of Operation Wolf. 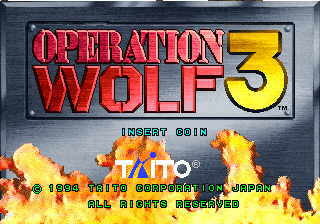 But it really came across to me as if Taito had made a new light-gun game, realised it was pretty crap, and decided its best chance to sell a few units was to tack on the Operation Wolf name in the hope that would do the trick. And it probably did. 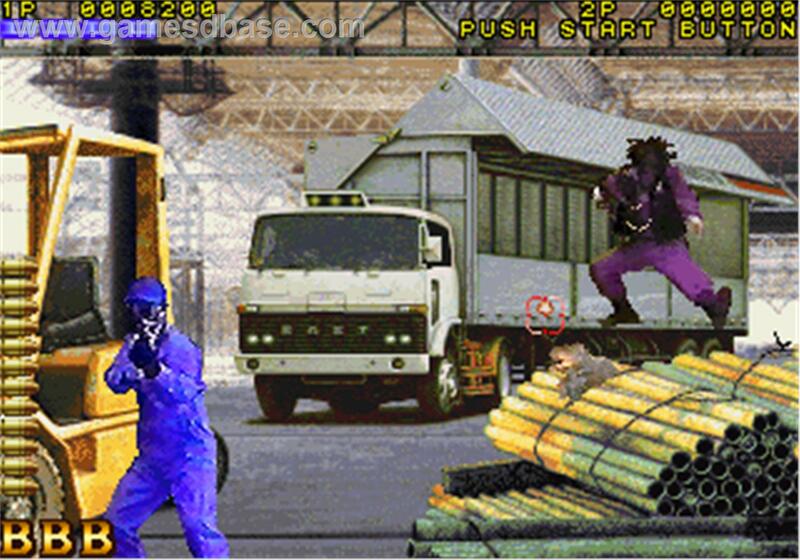 Dirty trick, Taito. Very very dirty. In the interests of gaming history, however, I'd recommend you give this game a quick go, just one credit, if you stumble across it somewhere. You'll probably complete the first couple of levels, but by the time you get to the "Tower of Them" (Ah, Taito, at least some things never change... your Engrish is excellent) level, don't bother wasting money continuing, just call it a day, and move on to the next, better game. What is this crap? I just tried Wolf, TB, and 3 for the first time ever and I can't help but feel that 3 is the best. I was already getting red flags from the bizarre suggestion that Thunder Bolt was anything but Wolf cranked up to 11. It doesn't really play that differently, seeing as 90% of lightgun games descend from Wolf to begin with. 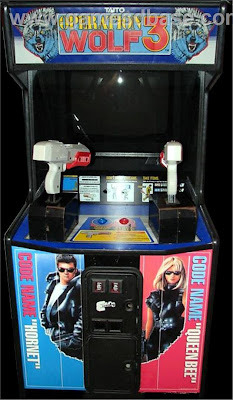 I actually kinda like that it plays more like Virtua Cop, because Taito didn't exactly have a game like that, and because it's a somewhat better concept. The game is a LOT less brutal to start than the first two, which is a really big deal. The (stereo)typical ragging on digitized sprites is probably at its worst here, seeing as MK is literally the same implementation (and multiple times at that). People happening to like the game has nothing to do with the graphics themselves, which work just as well in here as they do in MK. 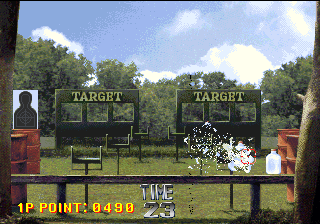 Complaining about gameplay mechanics for being "unrealistic" is silly when you're comparing this to a game where you shoot things to pick them up and where animals are loaded. Said gameplay change is also a large part of why the game is less insane. There's really not a lot more to say about this. 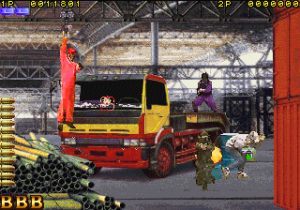 This game reminds me a lot Darius Gaiden and Elevator Action Returns, two other long-awaited sequels produced around that time (actually, all three games were released in 1994!). It should be put up there with those games, not bashed on by weirdos who despise a few changes and despise digitized graphics above all else. You even let me close with another seemingly small mistake: "THE TOWER OF THEM" isn't even Engrish. There are *much* better picks for Engrish in this game (such as the scene *3* name), so please pick one of those.